Traditionally, wood floor stains were also used as a base coat and to seal the wood grains of porous species like oak or ash, resulting in a smoother final finish. These days finishes don’t usually require sealers but stains are still useful, especially if you want to even out undesirable colour variations. Usually, a coat of stain can substitute for the first coat of finish. Stains can be grouped according to two characteristics: the tinting medium and the carrying medium, or vehicle. Stains generally get their colour from dyes, pigments or a combination of the two. In dye stains, the colouring is dissolved in the vehicle. The dye actually colours the wood grain and is absorbed into it. With pigmented stains, the pigment is dispersed and held in suspension so the pigments aren’t absorbed and don’t actually colour the wood grain. They also don’t adhere as well as dyes, and their handling is more involved. Since there’s less absorption and adhesion, finishes applied over pigment stains aren’t as durable as those applied over dye stains. Staining wood floors is best done by two people. It requires skill and expertise. Make sure your floor sanding contractor has experience in staining floors if this is the route you decide to go down. 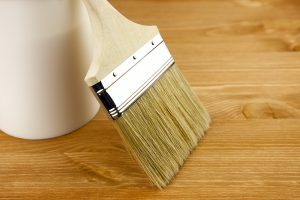 Otherwise, you risk and uneven application that is difficult to rectify.Before applying any finish coats, your stain must be thoroughly dry, so this process makes the project more time-consuming.